I love big fish, big fish regardless of species. One of my current job duties is oversight of our fish state records, so let me give you a little summary for 2009. Here is the up-to-date list of Nebraska’s record fish, RecordFish . In 2009 we had 10 records certified. There were two rod and reel state records, a shortnose gar and an exotic species, European rudd. The shortnose gar was large enough to be certified by the National Fresh Water Fishing Hall of Fame as a new all-tackle, world’s record. There were 5 bow and arrow state records in 2009; spotted bass, black buffalo, river carpsucker, spotted gar and goldfish. We had two underwater spearfishing state records certified, one an orangespotted sunfish and the other a redear sunfish. Finally, we had one fish certified as a surface spearing state record, a white sucker. I believe if you look back through my blog posts you can find more information and pictures of all of those record fish. If you think you might catch a record fish this year, the rules are listed on page 29 of the 2010 Fishing Guide, http://www.ngpc.state.ne.us/fishing/guides/fishguide/FishGuide.pdf . Most importantly you will need to have the fish weighed on certified scales, and that weighing must be witnessed by at least two people one of whom must be a Nebraska Game & Parks Commission employee. You will also need the species of fish verified by a Commission fisheries biologist. If you catch a record fish on a weekend or sometime when you cannot contact the folks you need to verify the record, keep the fish alive as long as possible. If the fish dies it WILL NOT lose weight as long as you keep it from drying out–keep it on ice, keep it in water. As a matter of fact, if it is in water it may actually gain a little bit of weight if it dies. If you want to set out to catch a record fish on purpose, here is what I would suggest: First of all, check the 2010 Fishing Guide where you will see weights of all the fish that have established records. That will give you an idea of the size of fish you need to be in contention for a state record. There are numerous species of fish that do not have archery, underwater or surface spearing records established, and if you want a record fish those would be your best bet. Make sure you follow all rules and regulations! There have been several fish submitted for records that were denied because they were not taken in accordance with all the rules. OK, let’s have some fun. Let me “call a few shots”. Here are some species where I believe there is a chance the rod and reel record could be broken: blue catfish, muskellunge, redear sunfish, tiger trout, and maybe walleye. I wish someone would bust the rod and reel blue catfish record as the one we have on the books was actually a fish that was snagged back when it was legal to snag those fish. 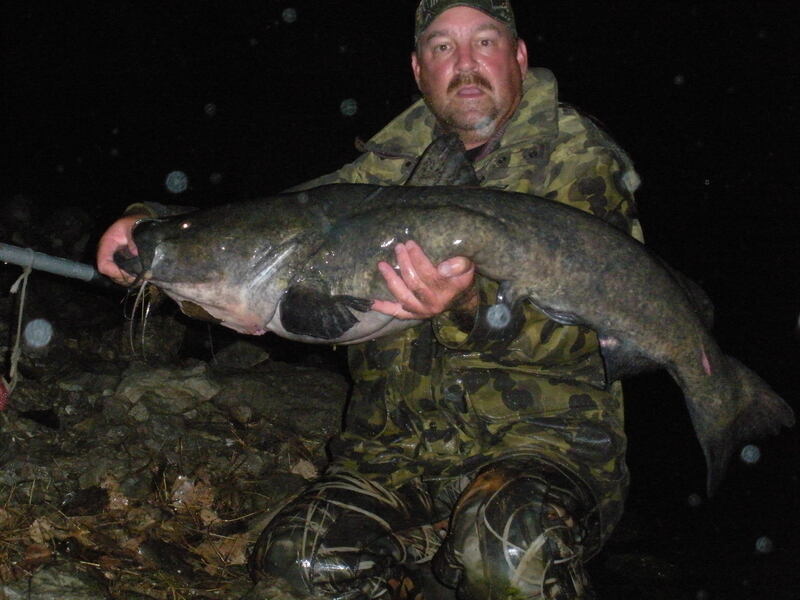 It will take a 100 pound, 9 ounce or larger blue cat to break the record, but there are some blues that big in the Missouri River. We saw a few muskies caught from Merritt last year that were large enough to push our state record; I believe there could be one swimming there that is big enough to break it (don’t bother fishing for it though, because I am going to catch it! Ha). We do not have a lot of redear sunfish in Nebraska, but our rod & reel state record is not an exceptional redear sunfish and I would like to think we could push that higher. Tiger trout are a brook trout/brown trout hybrid and again there are only a few of those fish present in Nebraska waters. But, we have documented some tigers in waters where brookies and browns are both present (the hybrids can occur in the wild) and a 6-ounce tiger trout is nowhere near the growth potential of those fish. I would consider a new state record walleye to be a long-shot; the chances are slim and none and “slim” might be walking out the door, but there have been some very big walleyes, fish up to and over 15 pounds, documented in McConaughy and the Missouri River above Lewis & Clark in recent years. A 15-pound walleye is in the ballpark and such a fish could very well be state record size if it survived for just another year or two. On the other hand, how about some rod & reel state records that I believe might stand forever: largemouth bass, striped bass, tiger muskellunge, sauger, brown trout, and cutthroat trout. I will bet some of you are shaking your heads at my putting largemouth bass on this list because every year I hear stories about largemouths that were big enough to be new state records. The only problem is I am still waiting to see one of those fish verified. There are 8-pound largemouth bass caught in Nebraska every year and occasionally some 9-pounders, but a 10 pound 11 ounce largemouth is a huge fish for northern waters and I doubt that record will ever be broken. The odds would be very slim. I could ramble on about a record largemouth but let me save that discussion for some other time. Our striped bass state record is a very respectable fish for inland waters and we have very few stripers left in the state anymore. The same could be said for several other records we have on the books, fish that are darned scarce if not gone from Nebraska waters: Sacramento perch, chinook, coho, and Kokanee salmon. Likewise we do not stock any tiger muskies in Nebraska anymore and our current rod & reel tiger muskie record is a very respectable fish. Our sauger record is an 8 pound 5 ounce fish and frankly I doubt that any pure-bred sauger could reach that size. We now have the ability to look at the DNA of those fish and I suspect if we had that technology back when the sauger record was caught we would have found some walleye blood in that fish. We still have plenty of brown trout in Nebraska but our rod & reel state record is absolutely ginormous at 20 pounds 1 ounce. I doubt if we ever have brown trout that come anywhere close to that size again. Would you believe the holder of our rod & reel state record brown trout is the brother of my aunt? I believe you can still see that fish mounted on the wall of Colburn’s tire shop in Valentine. Finally, we have not stocked any cutthroats in Nebraska waters in years and I doubt there are any of those fish left in the state. Feel free to question my judgement on the likelihood of those records being broken. Better yet, prove me wrong! I believe having big fish present in our waters is very important because they fuel the imagination of every angler! You just never know and every year there are some fish caught that surprise me. The next record fish will not care who’s line it bites on; it could be the 4-year old with a cane pole or it could be one of the best “sticks” in the state. You just never know, so you better GO FISH and see what happens! You didn't think I would blog about big fish without coming up with an excuse to show this picture again, did you? I believe this fish was large enough to be a new line-class, catch & release world's record, but I was alone that night and did not have the required witness. That just means I have to go catch her again! What if you catch a fish that is catch and release only? Seems like you’d have to break the law to get it certified. If there is a catch & release regulation, those fish have to be released immediately. To qualify for a state record a fish has to be weighed on certified scales and there would be no way to accomplish that without violating the catch & release regulation. Furthermore, we would not certify any fish as a state record if it was taken in violation of any of the fishing regulations. However, you could snap a few quick photos of such a fish and claim bragging rights! And I dare say if any angler did that, he or she would garner a lot of respect from all Nebraska anglers.